Another puzzling photo received from Mark Dawber (New Zealand) "Can you please identify this 1800s vehicle?" 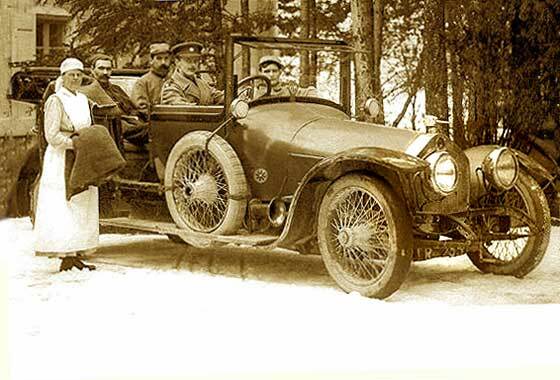 -- This is one of the earliest vehicles we had identified and is one of the very earliest of vehicles built by Gottlieb Daimler. World's first four wheeled car with four-stroke internal combustion engine. World's first Taxi. This is a batch of cca 1898 Cannstatt Daimlers, two cylinder, 16mph, 1,525cc. 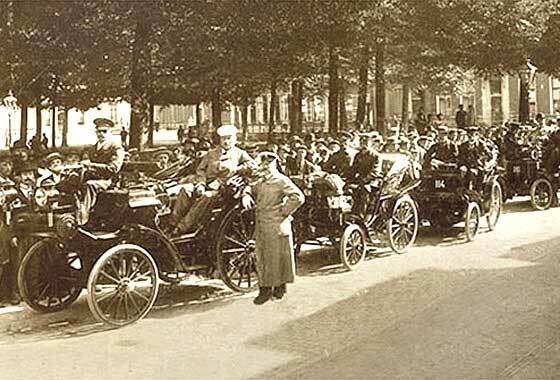 First club tour of the Automobile Club of the Netherlands (N A C), August 8, 1899. Our Publicity Officer Tony Russell (UK) received this photograph of a mystery car seen by a friend at the Paris Retromobile. What is it? 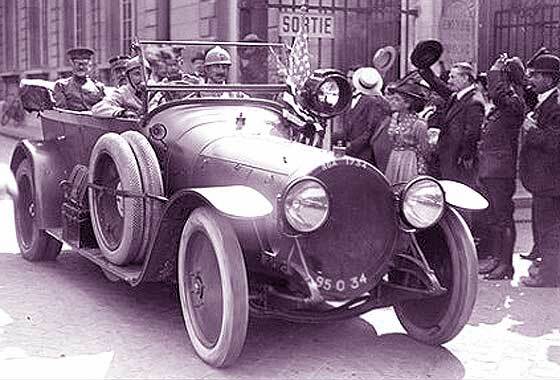 -- Quite a historic vehicle, being one of the very first cars built by Louis Renault. This is a cca 1898 Renault Model A Voiturette he built for a friends' father. Twelve were ordered on day of driving through Lepic in Monmatre for delivery. 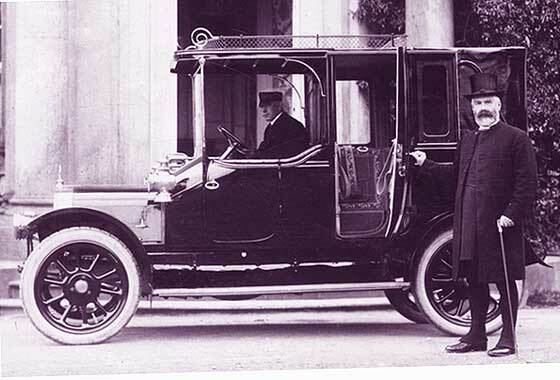 Powered by a single cylinder De Dion Bouton 273cc 1.75HP engine, enabling 20mph. 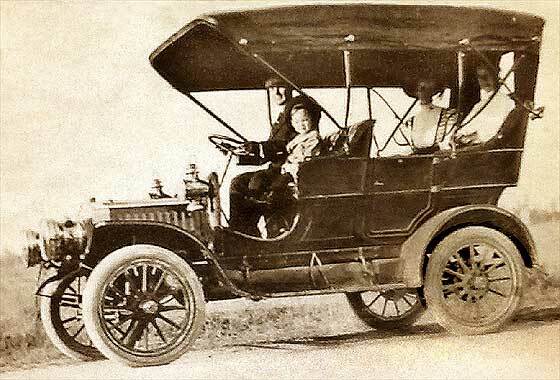 Model B was first enclosed car. 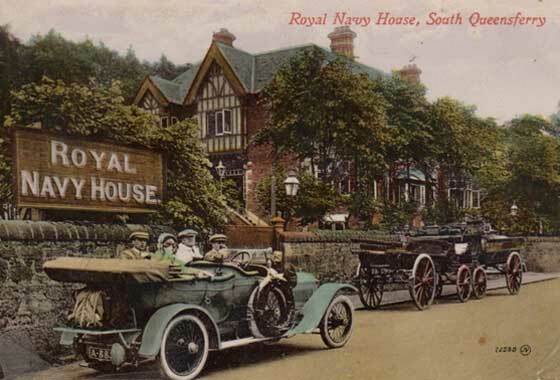 Photograph posted on the PreWarCar website by Alex Selley asking if anybody can identify the car in the photo. 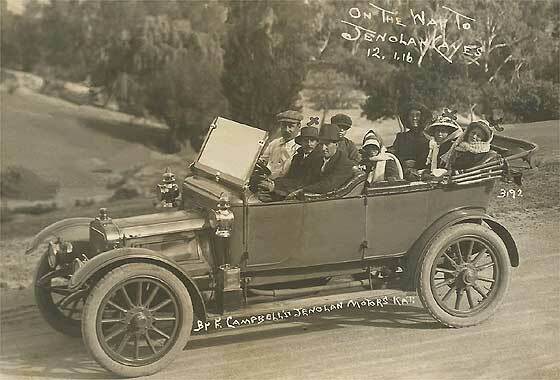 Believed the driver was a Mr. L. Gillespie who was a doctor in Claremont, Western Australia. -- The car was of "British" origin but not actually made in Britain. 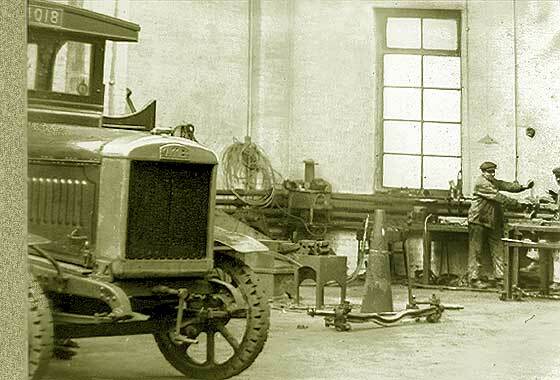 Speedwell Motor Co were agents in the UK for Gardener Serpollet steamers, Leon Bollee, MMC etc but assembled French Lacoste & Battmann cars using French De Dion Bouton engines. New radiator shape introduced 1904/5. 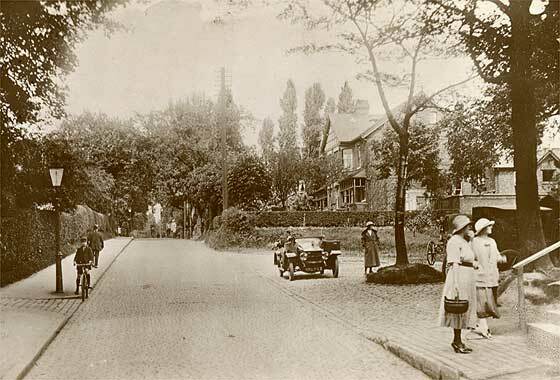 Puzzling period photo received from Richard Griffiths (UK) taken around 1910 at a house named 'Caprons' in Claygate, Surrey. The driver is almost certainly Richard Henry Wilkinson and probably niece, Evelyn Knocker; album compiled by grandmother, Louisa Forbes (neé Wilkinson). 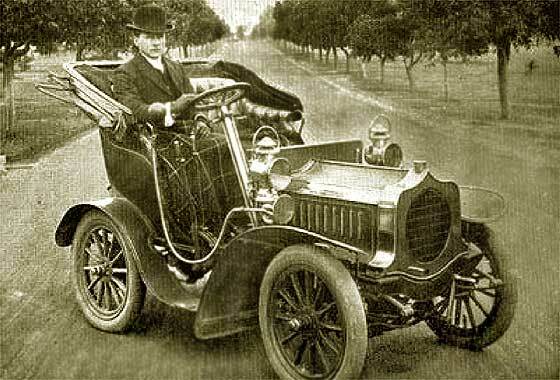 -- Confirmed by Ariejan Bos as a cca 1905 De Dion Bouton 8 HP Two-Seater. From 1905 onwards this type had two outside levers. 'Wind Screen and Hood' original, but half-door and rear trunk extras. Puzzling period photo received from James Carter San Antonio, TX (USA) who is investigating the the make of a car sold in the USA in the early 1900s, - he thinks! -- This one initially looked quite easy but on closer inspection it was not the De Dion Bouton or Packard etc., I thought it might be because of the 12 spoked wheels. Advised by our Ariejan Bos that this is American cca 1908 Maxwell Model HC 2 cylinder 20 HP Touring Car, which annoyingly for me is very much the case ! Another puzzling photo received from Tom Cosens from Yorkshire (UK) of an old car he didn't recognise. This is from his collection of postcard curiosities on which he has no other background, but which are needing identification. -- Advised by our Ariejan Bos that this is a cca 1909 Colibri 8HP Tourer, two cylinder available in UK at £168. 30mph, 37mpg. Manufactured by Norddeutshe Automobil Werke in Hamlen, Germany (Pied Piper...) who also later made the Sperber and NAW automobiles. Puzzling period photo received from Derek Elliott (UK) "Trying to date the Belsize car. Appears photo was taken in early 1920s. Looks similar to a 1914 tourer model shown on your Help Pages. -- Our Belsize expert Tim Harding advises original car was not later than 1914 when rad totally changed. 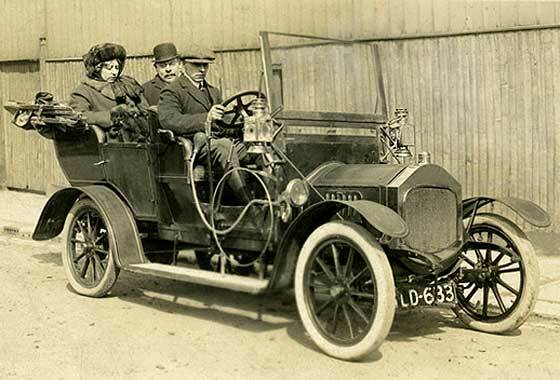 The scuttle is shorter and smoother than the original Edwardian Belsize body, so this car was re-bodied around 1920. Base car was probably Manchester made cca 1911 Belsize 10'12 Two-Seater. Lovely unusual coloured period photo sent to us by Chris Jones (UK) "Photographed in South Queensferry Edinburgh Scotland outside my old house. Built to oversee construction of Forth Rail Bridge, later a Royal Navy Hospital WW1. Always assumed it was a Crossley tourer?" --Tinting makes it a bit more difficult. Big hollow at the rad suggests the flutes of a Vauxhall. No slope as on a Crossley bonnet. Fancy body. 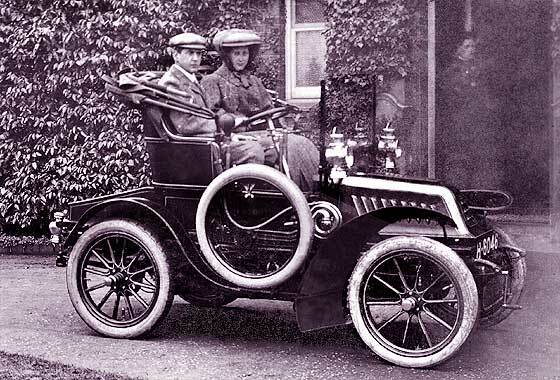 Two of our experts think this is cca 1913 Vauxhall Model B, 30HP 6 cylinder. 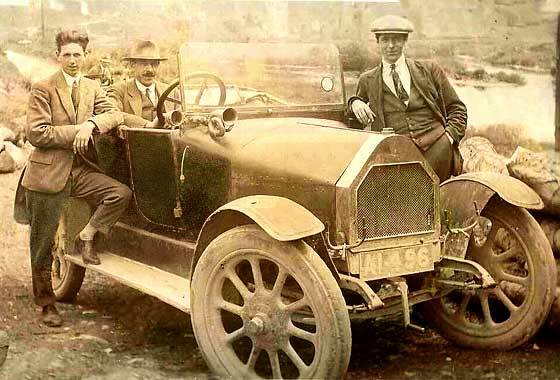 Intriguing photograph sent to us from Jean Carlan (France) asking if we can identify the car depicted. -- No further info on the photo and nothing on image search. The car is quite magnificent with twin rear wheels and massive searchlight. Made in Saint Denis, Paris, France, this is 'Car of the Tzars', as the make was much favoured by European Royalty. This is one of 55 from just before WW1 being used by the Military, a cca 1913 Dealunay Bellevile Type 06 8L Torpedo, Rothschild. Period photo sent in to Rootschat by Aus*Jen (Australia) asking if anybody can help identify and date car in photo from an inherited album? -- Jenolan Caves are a series of magnificent stalagmighty caverns in the Blue Mountains near Sydney. Discovered 1841 chasing a robber, caves became tourist attraction. Humpy radiator suggests Talbot, bolt through the middle of the radiator confirms it, and the scuttle dates it cca 1913 Talbot 25 Tourer. See also HP120 for Daimler. Lovely period photo received from Harvey Whittam (UK) in connection with Dorothy Allhusen of Stoke Court who set up a WW1 hospital at Le Martouret, near Die, France (photo), and also her home for the rehabilitation of Royal Flying Corps staff. -- Flat radiator and later style headlamps so likely c1918 Crossley 20'25 Tourer. 6,000 of these made during WW1 for the Flying Corps as staff cars, trucks and ambulances. May have twin rear wheels but hidden. Unlikely later 25/30HP out 1919. Another interesting period photo from a glass negative sent to us by Alun Pugh of Leeds (UK) " Can you please identify this lorry with a Halifax plate CP 927 and which is carrying sacks for Bell & Son, Keighley. " -- The bonnet shape is bit like a Renault but not much used in the UK. Designed by Herbert Austin in 1913 and not much changed by 1919 when production stopped with 2000 made. Used by UK & Russian Armies WW1. 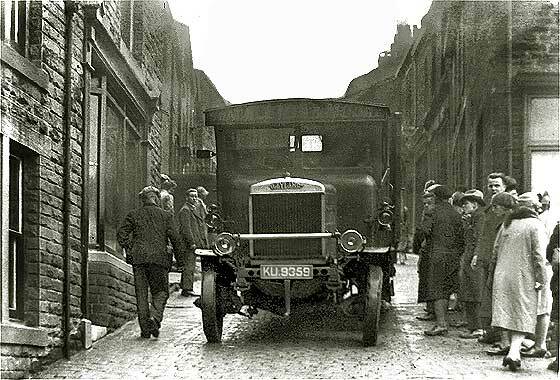 Registration pre1920 so cca1919 Austin 2 Ton 20hp Lorry. Puzzling period postcard received from Ian Cameron (UK) sent in 1927 and featuring people awaiting the Manchester train at Bramhal Station, Stockport, where he lives. Registration is NB 5847, which would place it about 1920. -- This one was another I should have got but Ariejan Bos advised it was a cca 1920 Briton 4'16 Tourer with a horizontal stripe on the radiator. Pointed bullnose rad used for very short time. Briton were initially part of the Star Cycle Co, making the Starling. Closed in 1922. Another interesting period photo from a glass negative sent to us by Alun Pugh of Leeds (UK) " Can you please identify this Karrier standing in some engineering shop? Number plate obscured but probably West Riding." -- The radiator fortunately tells us it is a Karrier vehicle originally made by Clayton & Co started in 1904, renamed Karrier 1920. 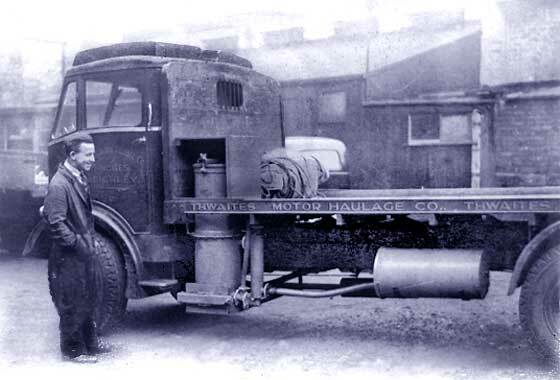 This is the cca 1923 Karrier Model K Lorry. Not much is visible but could be the 'H' variant four-wheeler for payloads of 2 tons made up to 1931. Another interesting period photo from a glass negative sent to us by Alun Pugh of Leeds (UK) " Can you please identify this Leyland lorry; Shackleton & Moore. I thought it was a bus at first with all the people. KU 9539 is Bradford." -- Registration is 1926 Bradford County Borough Council. 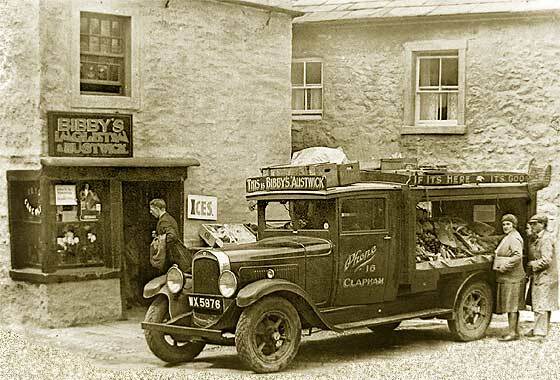 Appart from the rad having a Leyland logo, which does help, badge bar, the solid tyred wheels, oil burning side lights and double row of louvers suggests this vehicle is cca 1926 Leyland Q Type 4 Ton Lorry. Another interesting period photo that was a glass negative sent to us by Alun Pugh of Leeds (UK) " Can you please identify this bus from Bare Lancashire? Plate is TD 7098...[I think]." 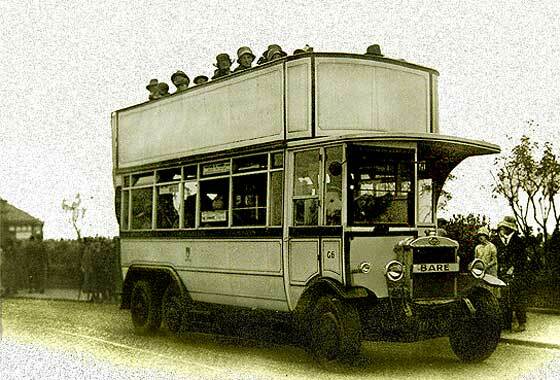 -- Rather pretty 'half cab' forward control open top double decker bus made by Guy Motors, founded 1914, in Wolverhampton. Came under control of Minitry of Munitions. Orders for WW1 meant success and busses to Brazil prosperity. This is cca 1926 Guy Model B 6 wheeler, dropped frame bus. 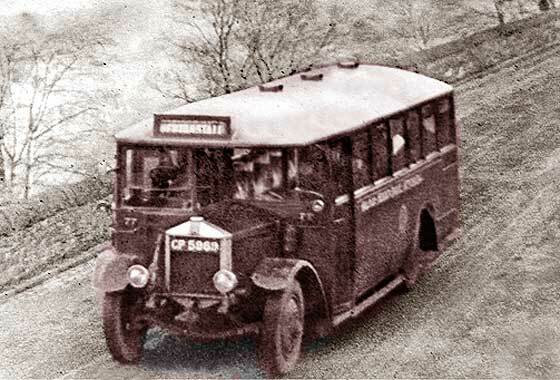 Another interesting period photo that was a glass negative sent to us by Alun Pugh of Leeds (UK) " Can you please identify this bus operating in Calderdale, Halifax, Heptonstall? Registration is CP 5969". -- Rather nice 'half cab' forward control single deck omnibus. Registration is County Borough Council of Halifax c1928. Badge on radiator has outline of a stylized sun so made by the Scottish Albion Motor Co of Glasgow. This is a 1928 Albion Viking PM28 with a forward entry passenger door. Another interesting period photo that was a glass negative sent to us by Alun Pugh of Leeds (UK) " Can you please identify bus operating in Calderdale, Halifax Hebden Bridge? Registration is CP 5970". -- Another 'half cab' forward control single decker. Reg. 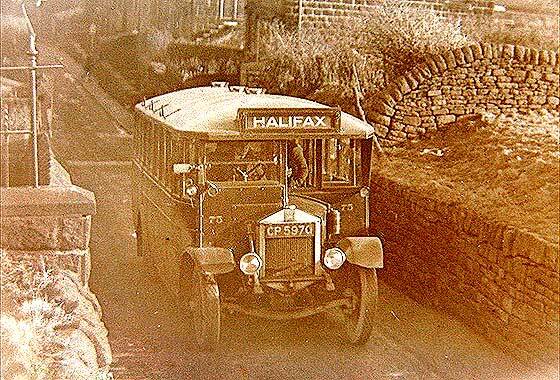 is County Borough Council of Halifax c1928. Registration is consecutive but bus number is plus one. Badge on radiator has outline of a stylized sun so made by the Scottish Albion Motor Co of Glasgow. This is a 1928 Albion Viking PM28. 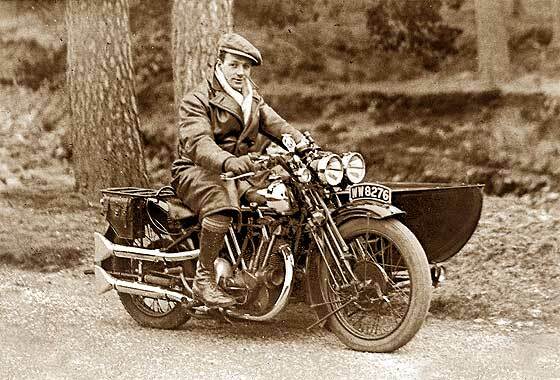 Another interesting period photo which was a glass negative from Alun Pugh of Leeds (UK) " I have several images of this motorbike and side car, WW 8276;Yorkshire. Any ideas please?" -- Registration is West Riding of Yorkshire. Our Chas Moody advises this is a cca 1929 Brough Superior SS100 Alpine Grand Sports with 986cc JAP V-twin OHV engine. They were also fitted with Matchless V twins. Lovely machine. It could well be that it is George Brough himself in the saddle (1890-1970). 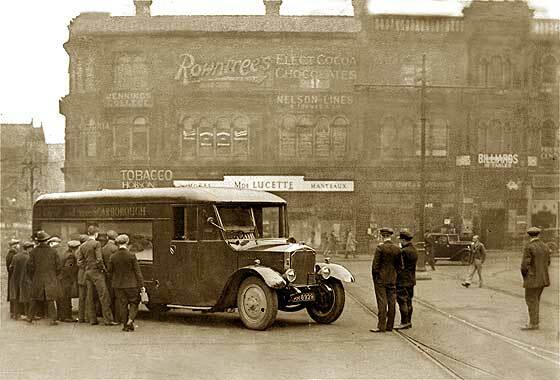 Another interesting period photo that was a glass negative sent to us by Alun Pugh of Leeds (UK) " Can you please identify this vehicle sporting Bibby`s of Clapham signage please? WX 5976 plate." -- Registration is West Riding of Yorkshire so established there is a Clapham there too! The Pickup is American and advised by Mark Dawber that it is probably a cca 1930 Overland Whippet 101 Canopy Top Body. Willys Overland cars and commercials were available in UK from 1911. Another interesting period photo from a glass negative sent to us by Alun Pugh of Leeds (UK) " Can you please identify this tanker with a Yorkshire plate. I see it is a Mammoth." -- Registration is West Riding of Yorkshire mid 1935. From having two front axles and two back axles, and from logos, it is a cca 1935 AEC Mammoth Major 8 Mk 2 introduced 1935 for heavier payloads of up to 15 tons by having additional axle, and powered by 6 cylinder 110HP engine. Replaced in 1948 by the Mk 3. Another interesting period photo which was a glass negative from Alun Pugh of Leeds (UK) " Can you help with these two Scottish lorries which seem identical to me?" 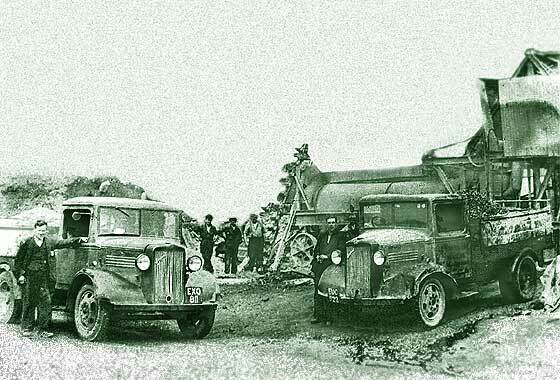 -- Lorry on left has reg EXO and right EUC which are both London County Council 1938, few months appart, so a coincidence they are both in Scotland?. Both lorries do indeed look similar and both are from the UK end of the General Motors empire. 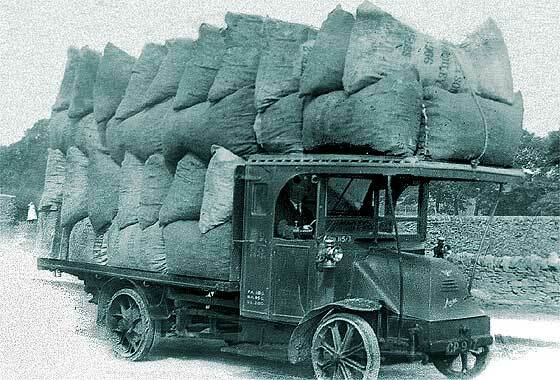 These are pre 1939 rad change, cca 1938 Bedford WLG 2 Ton Lorries. Another interesting period photo from a glass negative sent Alun Pugh of Leeds (UK) " Can you please identify vehicle; Thwaites Motor Haulage Co. Keighley?" -- We are not specialists in commercial vehicles and a particularly difficult angle photograph. However, from the sloping side quaterlight window we think this could be a cca 1938 Albion Flatbed Lorry converted during World War Two to run on Wood Gas. Wood gasification is the conversion of firewood into combustible gas by heat. Another very puzzling period photo sent to us by Tom Cosens (UK) "Please would you have a look at this lovely car for me, as I'm struggling to identify it. Photos from postcards?" -- Regretfully NO! This photo has done the rounds of all of our experts and none of them have come up with even a suggestion, which would make it a rare car. British bonnet handle? Three wheel nuts was Lagonda but nothing this big in their early small cars. Suggestions poss French, less than 12 HP. Another very puzzling period photo which was a glass negative sent by Alun Pugh of Leeds (UK) " Can you please identify tourist bus in St Georges Square, Huddersfield; Reg RR 8929...Northamptonshire?" --We are not specialists in commercial vehicles and the radiator on this one is unusually elaborate for the period. It seems to be a "show bus" and script on the side reads "Come and see Scarborough". 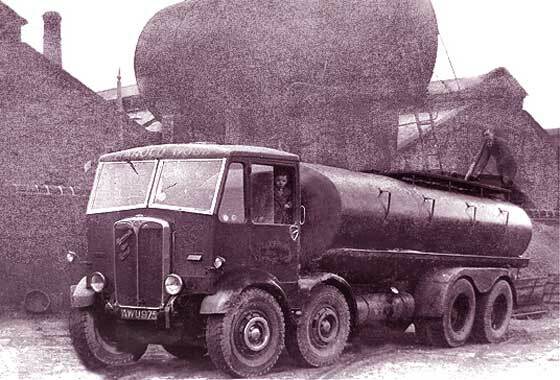 Only lorry with similar rad was much earlier Albion, and Albion did make specials.